The conceptual creation of Tzolk’in’s self-titled release is a collaboration conceived by Empusae’s Sal-Ocin and Gwenn Temorin of Flint Glass. Mayan mythology and the ritual calendar called Tzolk’in was the inspiration for the ritual sounds and mesmerizing beats produced on these eight tracks. 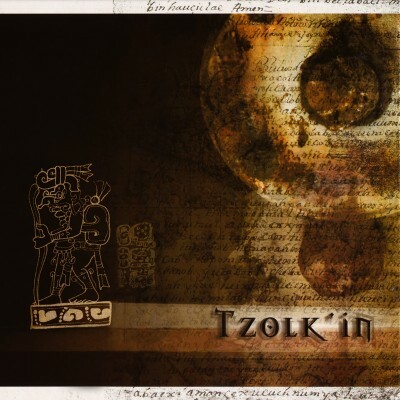 Mastered by Herman Klapholz of Ah Cama-Sotz, Tzolk’in becomes a part of the growing trend of exotic beats and conceptual elements that create sounds merging modern technology with ancient ritual. Briefly, the Tzolkin’ calendar is a cycle of 260 days. Each day in the cycle can be identified by both a day number and day name glyph. There are thirteen day numbers and twenty day names used in combinations to identify dates. Some of these dates and symbols are the names used for track titles – such as, “Imix”, “Chikchan” and “Kaban”. Each track is crafted meticulously and ranges from hard beats to procession-like drones. Tzolk’in will obviously appeal to fans of This Morn’ Omina and the likes. I hope to hear more from this duo, as there are 252 more days they can fulfill in the Mayan calendar.